Information you need to live a happy, worry-free retirement! You didn’t expect a fall to end your dream safari vacation. But now, in an African hospital with a broken hip and mounting medical bills, you face an unfathomable decision: recover there for weeks, or cough up $100,000 for medical evacuation to get home. Premiums for travel insurance are based on a person’s age, trip length, and if trip cancellation coverage is wanted then also the prepaid nonrefundable cost of the trip. To figure your prepaid nonrefundable costs, ask yourself what trip costs could you afford to lose if an illness or accident happened the day before you were supposed to travel, Drennen said. In general, Medicare won’t cover health care you get while traveling outside the United States. Medicare Supplement, which is also called Medigap, may offer additional coverage for health care services or supplies that you get outside the United States, but it typically does not cover 100% of costs, requires you to pay a deductible, and includes a lifetime cap. For example, Medigap Plans C, D, E, F, G, H, I, J, M and N pay 80% of the billed charges for certain medically necessary emergency care outside the United States after you meet a $250 deductible for the year. And, foreign travel emergency coverage with Medigap policies has a lifetime limit of $50,000 — a figure that easily can be hit with one major medical emergency. Plus, it’s important to note that the foreign travel benefit in Medigap policies does not cover medical transport back to the states, Drennen said. 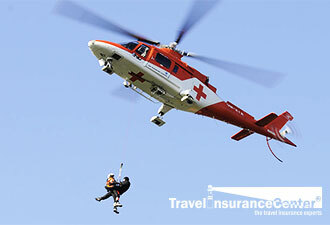 A medical transport to the United States via medical air ambulance can easily exceed $100,000. Let’s use a $10,000-per-person safari trip to South Africa to give you an idea of what travel insurance would cost. For a couple, both 72 years old, the Travelex Travel Select plan would cost $1,221 per person if insuring with trip cancellation coverage. But if you didn’t want to pay that much, you could choose the Travel Select plan for post-departure coverage, meaning if you had to cancel you wouldn’t be covered, for only $69 each. This would cover $50,000 of medical costs and $500,000 in medical evacuation per person and is a primary, first-payer benefit, meaning it would pay before your Medicare Supplement plan. Using our broken-hip scenario above, $147 —$69 for each, plus a $9 policy fee — is easier to swallow than the likely $100,000 for medical evacuation, not to mention any out-of-pocket costs you’d incur for the ambulance, surgery and hospital charges not covered by your Medigap policy. If you are wanting trip cancellation protection, Drennen suggests speaking with a licensed agent at Travel Insurance Center. In addition to the medical and medical evacuation benefits, other common benefits found in post-departure coverage include travel delay, lost or stolen baggage, baggage delay, missed cruise connection, and accidental death. If you’d like to discuss how to protect your next trip, call Drennen and the other licensed travel insurance agents at Travel Insurance Center at 1-866-979-6753, or email info@travelinsurancecenter.com. For any questions about Medicare Supplement, call Medicare MarketPlace at 1-800-639-0781 or visit www.MedicareMarketPlace.com.